The Best 50 Years: First Memorial Quilt Pattern Published! Well, I'm excited - after several days of fine-tuning, my first memorial quilt pattern is ready to publish! How cool is that? It's been a long time coming, that's for sure. But thanks to technological advances and the evolution of the Internet, my dream is finally a reality. During 6+ years of creating custom memorial quilts from clothing, I've also given guidance to others whenever asked. I have a wealth of experience and am happy to share. 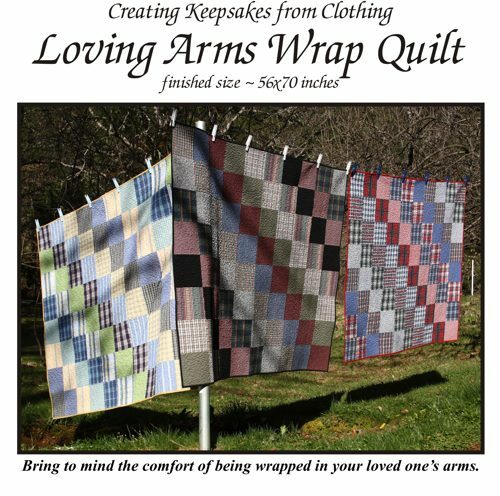 Several years ago, I even submitted a book proposal to one of the quilt/craft specific publishers based on creating keepsakes from clothing. It was turned down, however, due to the very reason it was written. Apparently, a book that encourages people NOT to buy fabric isn't very appealing from a marketing standpoint. So I decided to self-publish but the time wasn't right. Figuring out the marketing and distribution were the major obstacles but all that has changed! I have several publishing goals for 2013 and it's so nice to have already accomplished one! For now, my patterns will be available on Craftsy. And when I get a full book written, I will gleefully publish it through CreateSpace. The Loving Arms Wrap Quilt requires basic sewing skills and just 10 shirts for the quilt top. Then you need backing, batting and binding to finish your quilt. While the cover quilts are each 56x70 inches, I've also included cutting adjustments to make both a larger and a smaller size. In addition to the detailed instructions, the 15-page pattern also includes extra tips and notes, color examples, and a to-scale quilt layout grid. If you or someone you know would like to create a memorial quilt, please send them my way. Just go to the pattern page on Craftsy or check out my Custom Memorial Quilts website for info and ideas.